Simon Scholar. Stanford Alumnus. And Tom Ford Fellow. Bear Nash: Thank you for joining us today, Luis. Can you start by telling us a bit about your background growing up and attending public school in Santa Fe. This is interesting to me because when you are so deep in something it becomes trivialized and you don’t really think about it. My experience in the public education system was similar. It was just a part of my life and it wasn’t until after I graduated and was able to look back and compare my experience in public school with that of my peers in college, and be critical about it. Looking back my experiences were marked by great mentors who were necessary because of other factors of the education system that I wasn’t aware of at the time that made my journey more difficult than it may have been for other students. I look at my parents, for example, who didn’t have the opportunity for formal education. My mom didn’t finish middle school and my dad didn’t make it to middle school. So thinking about that layer of them not knowing what a formal education system looked like and how they could best be supportive of me given they didn’t have that context. Add to that the layer of them being immigrants to the U.S. and not speaking English, not being able to communicate with teachers and not knowing the best ways to plug into my academic learning and development. This was something that didn’t seem difficult at the time, but looking back I am stuck by how lucky I was in meeting some really great people and being able to supplement my learning along the way. My journey through the education system was in part that mentorship piece that is inextricable from the great amount of luck that I had in finding great people to support me along the way. BN: Thanks Luis. You comment on the role of mentorship in your journey. Can you speak more to that and how it influenced your experience in comparison with some of your peers? Also, what aspects about you do you feel have helped enable you to achieve what you have? LO: Given the work I want to do for the rest of my life, this is a really interesting question that I think about. Many people will ask, what did you do? With the thought of identifying the important factors and trying to replicate that for other students. What I have realized with time is that doesn’t work. In looking at some of my peers now in college who have benefited from substantial privilege I also recognize that there were factors in my community that incentivized habits in me that enabled me to unlock opportunities. While I certainly needed to have a lot of grit in facing adversity with a certain mindset, with time I have become more critical of my own privilege relative to others in my community. Rather than think of everyone as homogenous and starting from the same place, I see my community as a very diverse one. This has really helped me to identify areas with room for growth to help students develop habits and mindsets that will help them be successful. For instance, I think I have been very lucky in having parents who, despite not having been able to pursue formal education themselves, they recognize the value of it. We might not have had many luxuries around the house but whenever I needed things for school: books, supplies, or just support, they were always willing to go that extra mile for us. So recognizing these circumstantial pieces around me even as someone with the identities that I hold and how I may have lacked privileges in some ways, I was also quite privileged in other ways. So I find thinking about these factors important in a broader narrative of success if we’re going to be able to work to meet people where they are to help them create the futures they want to see for themselves. BN: I know that you recently graduated from Stanford University. Can you tell us a little about the journey that that led you there? Fast forward two years later the idea had been planted in my mind and I didn’t realize how much of an uphill battle the process of applying and getting admitted would be. Like I mentioned, I was in the system where I wasn’t aware that certain students had an upper hand when it came to applying to these prestigious schools. That’s when I started realizing that actually Stanford was in California, one of the states that I swore I wouldn’t end up for college (laughs). It was not an Ivy League school and has a huge emphasis on technology, public service and computer science. It took a lot of talking with my mentors, including Christina and Mike at Simon, about my values and what it was that I wanted to get out of an undergraduate experience. 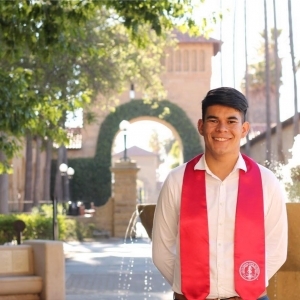 I realized that the reality of going to Stanford was something I was willing to put all my energy into in order to make it a reality, regardless of the uphill battle I was going to have to go through. And that took the form of many things. Working really hard to polish my essays and communicating the importance of making this decision. Many long nights studying for the SAT and ACT to make sure my scores were competitive. And working hard in school, taking AP classes, and keeping my grades up so as to make this a reality. BN: Stanford is widely regarded as one of the top universities in the country. Can you tell us about your experience there as an undergraduate? LO: Overall Stanford was an incredible experience on multiple dimensions. I was pushed beyond my comfort zone in terms of the people I was exposed to and realizing how diverse people around the world are. Pushed academically to hone my skills, and even though I didn’t come in feeling overly competitive, I could hold my own against other students in the classroom. Stanford really pushed me in a great way. It was an important shift for me around academics when my language changed from wanting to compete with other students, to thinking about academic growth as something that happens in collaboration with other students. That was a really impactful lesson for me; realizing that I had a lot to teach other students and they also had a lot they could teach me, and that it wasn’t only the professors that I could learn from. Any other student that finds themselves in a similar situation moving away from home to a place where they know no one and being around people who on the surface seem really different is very challenging. It was also really exciting to have the opportunity to think about who I was and what parts of me stayed true beyond the context that I had found myself in up to that point. The other really salient piece, and I remember this lesson very clearly: I was overwhelmed, in a great way, by how many opportunities were now readily available to me, in terms of the courses I was taking and opportunities to explore my passion, and in terms of the support that I had to find and secure internships to learn from professionals in my field. This was all amazing and incredibly overwhelming in a positive way, and as I alluded to previously, I started becoming aware of the differences in the new education system that I was entering now. Coupled with this overwhelming excitement was a sinking feeling that it would be a very, very long time before anyone from my high school would be able to attend Stanford in the future. And that to me felt really wrong, which is where my passion for education started. I didn’t want to be the only one from my high school to have access to these incredible opportunities because I thought that was something that everybody needed the right to. BN: Is there anything that surprised you about the experience of attending Stanford? LO: Yeah, I mentioned how it was interesting being exposed to people who on the surface seemed very different. Something that surprised me was that often these differences were very surface level. At the end of the day one of the things that really connected with the other students was the fact that we all had a very deep-seated passion for making the world better. That was something that I didn’t expect that I was really able to hone during my time there. BN: Can you say something about how this experience has influenced who you have become today? LO: Yes, absolutely. Before I say how I’ve changed as a result, or how it’s influenced who I’ve become, I think its Important to say what has stayed the same. And that is my values. The values that motivated me in the first place to go to Stanford are the same values that I live and breathe today. I think the biggest change in me is having access to the means of really refining my values. I’ve been exposed to many really amazing people who are leaders and have great insight into how to catalyze change. The other thing that has really changed is the ability to see myself as a leader. I always thought of myself as a leader, but there were always doubts about “well maybe I’m not actually meant to be a leader – leaders look like this,” when you think about the leaders in history that will be remembered through eternity. I think I’ve realized that leadership can take many different forms, and that anyone can be a leader; it’s just a matter of finding how it is that you can lead given who you are as an individual with a unique skill set. I think the best way to teach someone to be a leader would be to teach them to be reflective. I think that is as close as you’re going to get. BN: I think that is really interesting Luis. Can you say a little more about that perspective on learning leadership? LO: Of course. I think it takes a very brave person to look at themselves and say these are the things that I do really well and these are the things that I need people to support me with in order for them to be done well. If you are a person who can make that assessment of yourself and then find ways to leverage the positive skill set that you do have, while identifying how others can complement that. I think that is an incredibly powerful way to expand the way you think about leadership that is inclusive of others while leveraging your own skills toward realizing the change that you want to create. BN: I understand that in your senior year at Stanford you received the prestigious “Tom Ford Fellowship in Philanthropy,” Can you tells us a little about that amazing opportunity? LO: Stanford offers a few post-grad fellowships to a limited number of students. I believe there are 7 in total. You can think about these fellowships as a blank check for students who have demonstrated a commitment to public service to continue exploring this commitment in more of a sustained way and a means of launching their career in this field. The Tom Ford Fellowship is for students interested in working in philanthropy. Three students are selected and once selected you begin a landscape analysis of all the grant making organizations in the country you are interested in. Then you start to reach out and connect with representatives at those organizations. Through those conversations you start narrowing your list to identify a specific partner whom you want to work with for the following year. I arranged a placement with the Chan Zuckerberg Initiative which is an organization founded by Mark Zuckerberg, the founder of Facebook, and his wife, Priscilla Chan. The goal of the organization is to unleash human potential. To me that goal to create better futures for everyone was really the drive. I had identified education as the area I wanted to work on, so in doing my landscape analysis of the grant-making organizations I was focused on those that are influencing the education space. I spent a lot of time on this research before ultimately pursuing a position at the Chan Zuckerberg Initiative. The great thing about this process was that I learned a lot about what is happening currently in philanthropy around education. I also made some great connections with people at different organizations across the country. All this contributed to building a great platform for me to ask questions about how the education system is working currently and what initiatives are taking place in research and practice to improve the system for all students. BN: That sounds like a really interesting organization to work with in pursuing the work that you are compelled by. LO: Yes, there isn’t a single boring day. The organization is very young and it’s unlike any other. It’s sort-of a Foundation, and a tech company, and then you add to that the fact that it is a startup nearing its 3rd year of operations. It’s exciting to see what it takes to build such a large organization from the ground up, and to be a part of that. BN: Looking ahead, what do you see in your future? LO: That’s a huge question that I think about a lot. Let me give you some context first. I’ve learned to become comfortable knowing that my path will change so many times by the time I actually have to make a decision. And at the same time I have some ideas or goals that are aspirational that I am trying to work toward. I know that at some point I want to teach. I think that the classroom is ground zero where a lot of the magic happens and a lot of the really difficult but very rewarding, and 100% crucial, work happens when it comes to education and education reform. So I think that is just something that, not only I have to do, but that I really want exposure to because I feel it will be foundational to any of the work that I do in the education reform space. Eventually I want to go back to school. There are several potential paths, whether it’s a PhD in education, or a business degree, or a combination of both to gain both some practical skills in organizational management and exposure to the content and research on how and supporting learning. And finally, more long term, I’m excited to work at a higher level to employ the learning that I garner through teaching and the other elements of my path to create solutions to the problems. Whether it’s at the school level, the district level, or maybe the policy level. I really want to start thinking about how we can design entire school systems around the diverse needs of students. Making sure we’re not just thinking about outcomes, but also how you can nurture and support students on their personal growth trajectory. Also importantly, thinking about my own experience, thinking about how we can be better about engaging diverse parents in this process to ensure we are thinking about students holistically. BN: I know you’ve been in California going on 5 years now, and from our conversation today it seems that you draw some of your experience and passion from your direct experiences growing up in New Mexico. What is your connection to New Mexico and how does it play into your life now? LO: My connection with New Mexico plays a huge role. It very easy to fall into a mindset that, well now my immediate environment is California, therefore I don’t have time to think about home. Or as you spend less time in a place the concept of home becomes more nebulous and less tangible. I have been very intentional over the past several years to make sure that my connections at home stay strong, in particular those within the education space. Whether it was the opportunity of teaching with Breakthrough, which I have been able to do for a couple of summers when on break in Santa Fe, or working individually with students from Santa Fe High or Capital High as they apply for college. Or, frankly, whether it’s talking with my nephews, people who are related to me, about their education. Those are things that have allowed me to stay grounded in the work that I do and remember that at the end of the day, any decisions that are made in the education space are going to have very tangible impacts on people who I know, people that I’ve worked with in the same education system that has brought me to where I am today. There is also the great possibility that one day I will go home to bring this important work there. Right now I want to be exposed to as many different ways of thinking about these problems as possible and connecting with as many people as possible who have these great ideas. But I think the ultimate goal is to one day go back to where it all started and find ways to reform the space there to ensure that everyone has the opportunity to go to Stanford, or whatever that is for them, should they want it.